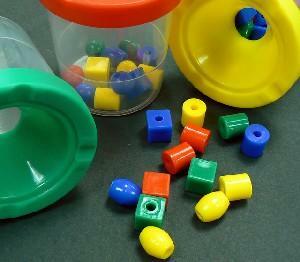 Educational preschool toys can be as simple as beads or small teddy bears or as complex as computer games and electronics. Young children learn most readily from the world around them. If you've ever observed young children at play, you've probably noticed that they fly from one task to another every few minutes. Because younger children have shorter attention spans, educational preschool toys should offer a lot of variety, color, and ability to be used for multiple purposes. Leap Frog offers a wide variety of educational preschool toys for ages three and up. Items such as the brand new Clickstart My First Computer teach children basic computer navigation skills through the television and without the safety concerns of Internet access. The Leap Pad system helps children learn everything from the alphabet, to letter sounds, to math, to foreign languages. Multiple cartridges can be purchased for additional learning opportunities. V.Smile is a portable gaming system that kids can utilize during time spent in the car or waiting in doctor's offices. This system can help kids get ahead of the rest of the class by using time that is typically wasted but in an engaging, fun way that makes kids want to learn. Vtech, the maker of the V.Smile offers many other children's electronic educational products, including telephones, alphabet boards, and adventure globes. Jump Start offers a series of educational computer software products to help children learn basic skills they'll need for Kindergarten and first grade. Titles include Jumpstart World, Math Blaster, and Jumpstart Phonics. Candy Land-teaches counting skills and good sportsmanship. Concentration-teaches manual dexterity and speed in completing a task. Sum Swamp-for older preschoolers this game will teach basic addition and subtraction skills. Great States Junior-teaches United States geography. Pick Up Sticks-this game is good for all ages and teaches manual dexterity. Busy beads- Kids are never too old for these interesting beads. Even adults enjoy the pattern of moving the beads from one section to another, and the hands-on action can help your child develop manual dexterity skills. Abacus-An abacus can be used as a sort of busy bead system but also can be used for teaching a child to count and complete simple math procedures. Manipulatives-Almost any item can be used as a manipulative. Jars of beads (be careful of choking hazards with young children and small items he might put in his mouth), small teddy bears, and even common household items such as buttons or beans can be used to help children learn basic math concepts. There are more and more new toys released every year aimed at the preschool age group. Entire conventions are built around new toys, and many of the toy manufacturers are smart enough to realize that parents want toys that do double duty-entertaining and educating children at the same time. From the tried and true toys that encourage play, such as kitchen play sets, building blocks, craft supplies, and puzzles on to the more modern concepts such as talking toys, and science kits, toy manufacturers offer a wide array of choices for your preschooler.